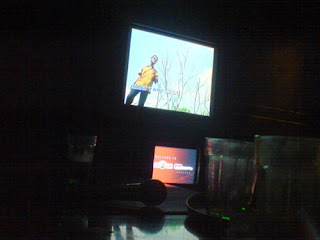 I tagged Dida karaoke-ing with her friends at Red Box Ria (SOGO) and we had a hilarious time. Her friends knew songs that I've never - EVER heard before and I can't help being amazed! heehee. And God, the cheesy videos -- they were my constant entertainment for the night. And of course, while we were singing away, a skinny Santa came into our room and offered some vouchers. hahahha! I think he dieted for the rest of the year so he could stuff his face with milk and cookies tonight without feeling guilty. Doesn't matter if you actually celebrate Christmas or not, the point is that EVERYONE celebrates the holidays, right? heehee. Hope you'll have a nice time around family.